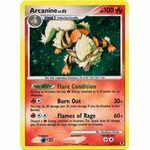 Poke-Body: Flare Condition: As long as Arcanine has any [R] Energy attached to it, Arcanine has no Weakness. [R][C] Burn Out: 30+ damage. You may do 30 damage plus 30 more damage. If you do, Arcanine is now Burned. [R][C][C] Flames of Rage: 60+ damage. Discard a [R] Energy attached to Arcanine. This attack does 60 damage plus 10 more damage for each damage counter on Arcanine. Poke-POWER: Fan Shift: Once during your turn (before your attack), you may use this power. Fan Rotom's type is Colorless until the end of your turn. [C}[C} Spin Storm: Flip a coin. 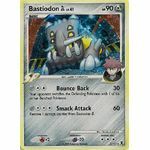 If heads, your opponent returns the Defending Pokemon and all cards attached to it to his or her hand. [C][C}[C] Air Slash: 60 damage. Flip a coin. 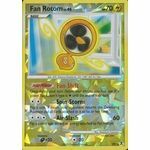 If tails, discard an Energy attached to Fan Rotom. [M][C][C] Bounce Back: 30 damage. Your opponent switches the Defending Pokemon with one of his or her Benched Pokemon. [M][C][C][C] Smack Attack: 60 damage. Remove 1 damage counter from Bastiodon GL. Poke-POWER: Frost Shift: Once during your turn (before your attack), you may use this power. 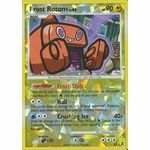 Frost Rotom's type is Water until the end of your turn. [W][C][C] Crushing Ice: 40+ damage. Does 40 damage plus 10 more damage for each Energy in the Defending Pokemon's Retreat Cost (after applying effects to the Retreat Cost). 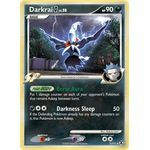 Poke-Body: Eerie Aura: Put 1 damage counter on each of your opponent's Pokemon that remains Asleep between turns. [D][C][C] Darkness Sleep: 50 damage. If the Defending Pokemon already has any damage counters on it, that Pokemon is now Asleep. Poke-POWER: Heat Shift: Once during your turn (before your attack), you may use this power. 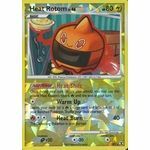 Heat Rotom's type is Fire until the end of your turn. [C] Warm Up: Search your deck for a Fire Energy card and attach it to 1 of your Benched Pokemon. Shuffle your deck afterward. [F][C][C] Heat Burn: 40 damage. The Defending Pokemon is now Burned. Incite: Search your discard pile for up to 2 Supporter cards, show them to your opponent, and put them into your hand. [W][W] Giant Wave: 50 damage. 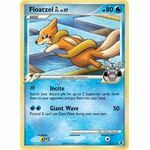 Floatzel GL can't use Giant Wave during your next turn. Poke-POWER: Mow Shift: Once during your turn (before your attack), you may use this power. 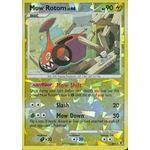 Mow Rotom's type is Grass until the end of your turn. [G][C][C] Mow Down: 50 damage. Flip a coin. If heads, discard an Energy card attached to each of your opponent's Pokemon.